The wasps are tiny, almost invisibly so, but their vandalism is evident all across the Island. “You can see it on the top of Prospect Hill; you can see it on Chappaquiddick; you can see it in Gay Head; and you can see it in my backyard in West Tisbury,” said Dr. David Foster recently. Foster, the director of the Harvard Forest in Petersham, Massachusetts, and a part-time Vineyard resident, was speaking of the Islandwide swath of defoliated and disfigured black oaks, their branches stuffed with, and strangling on, the larvae of so-called gall wasps. Insect infestations are nothing new to the Vineyard, of course: from 2005 to 2008 the fall cankerworm burned through as many as one thousand acres of oak trees before the caterpillar population crashed, possibly thanks to a fungus. Still, the speed and ferocity of the recent gall wasp infestation has surprised even experienced forest scientists. Foster and Tim Boland, the executive director of West Tisbury’s Polly Hill Arboretum, recently visited a particularly diseased patch of oaks at Quammox Preserve overlooking Katama Bay on Chappaquiddick. 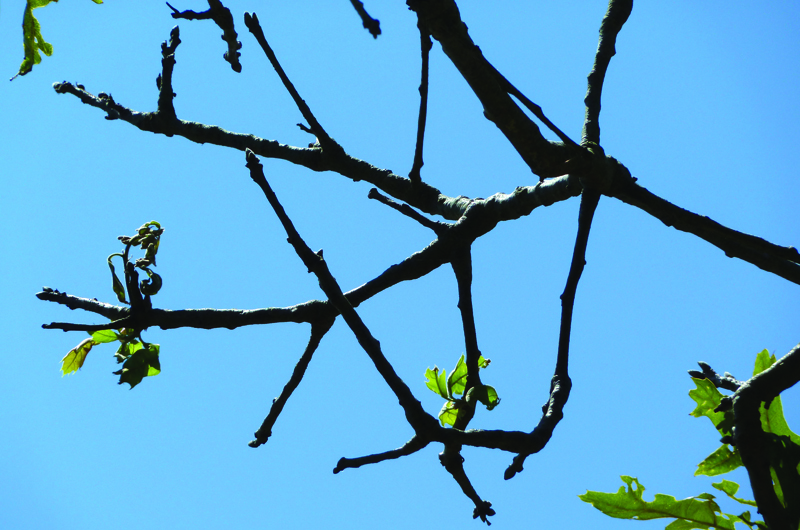 Boland saw the first indications of wasp-related dieback in black oak branches in 2008. In the past few years the wasps have become so successful that many black oaks are struggling to leaf out, often casting out unsightly shoots from their trunks in a last-ditch effort to stay alive. It’s the same story all across Cape Cod. While the fall cankerworm destroyed trees through brute force, feasting on leaves and defoliating entire forests, the gall wasp’s technique is more insidious. The wasps use the plant’s own biochemical toolkit against it, secreting growth-regulating hormones that, in effect, trick the tree into building a shelter – the characteristic galls – for its larvae. When mature, the insects chew their way out of the tree, an escape route that is evident in tiny perforations left in the bloated branches. According to Foster, the oak crypt gall wasp is most likely a native species whose life cycle normally takes place without damaging native trees. But something in the forest is out of balance. The tiny gall wasp lays eggs under the bark of black oaks, causing the twigs to bloat and the leaves to starve. When mature, the insects chew their way out, leaving behind telltale holes. “There’s a feeling that some of these insect explosions could be correlated with a warming pattern,” echoed Boland, noting that the wasp infestation came on the heels not just of the blistering march of the cankerworm, but also after a series of punishing droughts. “It appears to be that whatever used to keep these population numbers in check, one or more of those factors is missing from the equation,” he said. One of the main variables, he said, could be the severity of winters, or lack thereof. If that’s the case, this past winter’s prolonged cold spells could pay dividends in a reduced population of gall wasps. Or not: surprisingly little is known about the insects, which are only a few millimeters long. Boland has worked with University of Massachusetts entomologist Joe Elkinton, who visited the Island in October to learn more about the peculiar insect’s biology and life cycle, and there are plans to send specimens to the Smithsonian Institution for further investigation. But there is still much to learn. Likewise, a solution to the infestation remains a mystery. At the Polly Hill Arboretum, the mission of which includes experimental horticulture, eleven stately black oaks have been injected with emamectin benzoate, an insecticide typically used for caterpillars and beetles. But the efficacy of the chemical on the wasps is unknown, and the results so far are inconclusive. The greatest hope for a reprieve, therefore, will likely come from the natural cycle of boom and bust. In New York in the early 1990s, a similar outbreak swept through Long Island’s black oaks, from Nassau County to Montauk. Then, just as researchers began to study the insects, they all but disappeared and the blight was over. The respite might not last long, however. In earlier research involving pollen cores from Vineyard ponds, Foster saw evidence of a major decline in the oak population correlating with a period of climate change that occurred five thousand years ago. “These kinds of outbreaks could become more common,” he warned of the current crop of wasps. “You start producing an unusual set of weather conditions – you stress organisms in other ways – well, you just might be providing better conditions for pathogens and pests to grow,” he said. Despite the sensation of timelessness that a walk in the woods can give, the truth is, with intermittent droughts, plagues, fires and hurricane-hurled salt spray, the forests of the Vineyard are an ecosystem constantly in flux. Still rebounding from centuries of deforestation that lasted from the arrival of Europeans in the 1600s to the end of the 1800s, and more recently devastated by insect invasions, they provide a unique opportunity to study life in transition. That is exactly what Foster plans to do. Using National Science Foundation grant money, Foster has worked with the Polly Hill Arboretum, the Nature Conservancy, and the Woods family to establish twenty four-hundred-square-meter plots at the arboretum and on the adjoining Woods Preserve. There, he plans to let nature take its course, while he takes notes. “This project will go on for decades,” he said. But early results are already coming in. Since the end of the 2005–2008 cankerworm explosion that left sweeping vistas of oak lifeless and rotting, parts of the forest have dramatically shifted – from an oak forest to a sort of transitional shrubland, the understory now flooded with sunlight and filled with blueberry, huckleberry, and raspberry bushes. With the change in flora has come a change in fauna as woodpeckers have found prime real estate in the dead wood. Similarly, berry and flower-loving animals such as songbirds and butterflies are moving into space once dominated by acorn-loving squirrels and mice. All the dead timber and new growthhas also meant a change in how nutrients are cycled through the ecosystem. Foster’s team, which includes other scientists and a contingent of Harvard students, is measuring the annual amount of carbon and nitrogen being released and taken up by the forest. They do so above ground by inventorying the vegetation, and underground by taking soil cores, which are then burned to release their carbon. “Surprisingly, there’s actually more carbon below ground than there is above,” said Foster. Nitrogen pollution is a threat locally, where the element can seep into the groundwater and fuel harmful algae blooms in the Great Ponds. Carbon storage, on the other hand, is of concern globally due to its effects on climate change. The question, therefore, was whether the decomposition of huge swaths of the local forest would release nitrogen into the estuaries, or carbon into the atmosphere, or both. So far, the answer appears to be no. Foster has found the explosive new growth of the understory to be an effective sink for both. After years of trauma, the forest is healing itself.